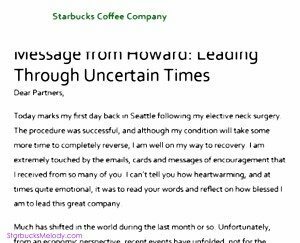 Message from Howard Schultz: Leading Through Uncertain Times. Today marks my first day back in Seattle following my elective neck surgery. The procedure was successful, and although my condition will take some more time to completely reverse, I am well on my way to recovery. I am extremely touched by the emails, cards and messages of encouragement that I received from so many of you. I can’t tell you how heartwarming, and at times quite emotional, it was to read your words and reflect on how blessed I am to lead this great company. 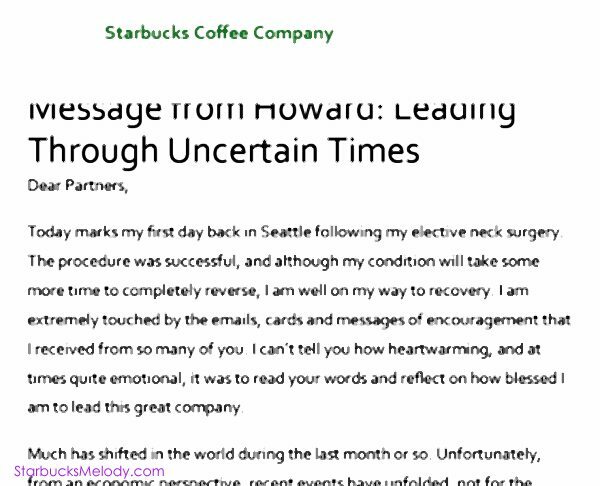 It’s nice to hear that Howard got all our cards and messages wishing him a ‘get well soon.’ And of course, I, as well as many people reading this article, feel optimistic about Starbucks’ future. It is still bright and strong and highly caffeinated. I never noticed until I read this on the portal, but Onward and Howard both end in “ward”. It just rolls off the tongue, doesn’t it? Glad HS is feeling well! @CamSpi – LOL. There are like what 175k partners? I am amazed at how well 175,000 people can keep secrets to be honest! I hope that SB continues to grow and keep the customer in mind as they move forward. Thanks Melody for sharing this memo. Well….. don’t have time right now..this requires a more thought-filled response, I feel. Am glad H.S. has gone thru his surgery successfully. Denise R am curious as to what went up. I don’t think my drink went up. Certainly, given the memo HS wrote you would wonder why SB is raising prices. @purple1 the price of whole bean coffee went up significantly, as well as the cost of some pastries. I’ve sen on MSI some complaints about the cost of pastries going up. I hadn’t really noticed that either, but it seems as though that’s the other increase in prices. Don’t know if this happened at any other Starbucks, but at my favorite/regular Starbucks the POS system started charging new pastry prices one day before the store received the new price tags or the notice that the prices on some pastries went up. The store manager said that the coffee bean price increase has already caused a noticeable decrease in bean sales.